On Digital now, coming to 4K Ultra HD Combo Pack, Blu-ray Combo Pack and DVD on March 19th at major retailers nationwide in addition to online at Amazon. The Academy Award Winner for Best Animated Feature Film, SPIDER-MAN: INTO THE SPIDER-VERSE, swings onto Digital February 26 and on 4K Ultra HD Combo Pack, Blu-ray Combo Pack, and DVD on March 19 from Sony Pictures Home Entertainment and Sony Pictures Animation. 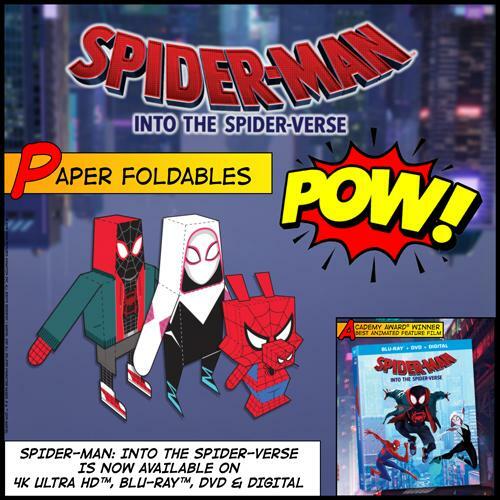 From Phil Lord and Christopher Miller, the uniquely creative minds behind The Lego Movie and 21 Jump Street, the film offers a fresh vision of the Spider-Man universe with a groundbreaking visual style that’s the first of its kind. SPIDER-MAN: INTO THE SPIDER-VERSE, a film that has grossed over $350 million in theaters worldwide to date, introduces Brooklyn teen Miles Morales, and the limitless possibilities of the Spider-Verse, where more than one can wear the iconic mask. 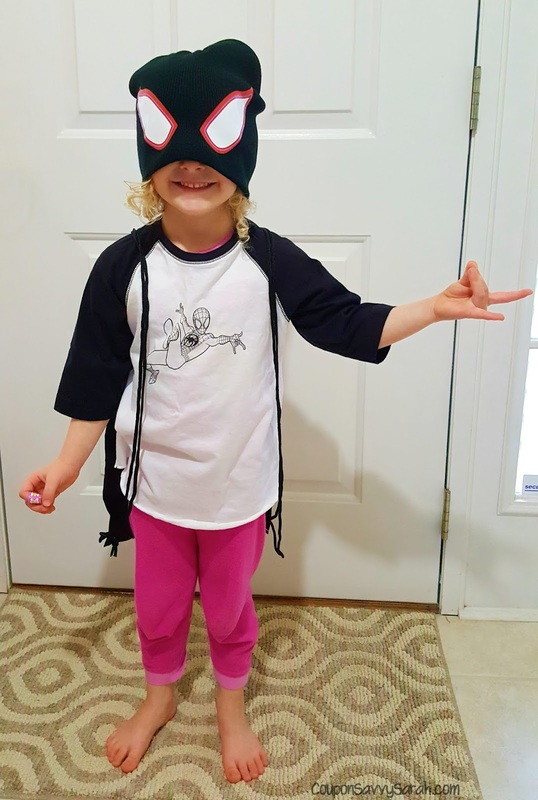 “One of the most rewarding experiences in recent months has been to hear that children are telling their parents that they see themselves in Miles, or that they want to grow up to be like Spider-Gwen, anyone can be a hero. That's why we made this film, and we hope that feeling of empowerment is something that both audiences young and old can take away,” say Directors Bob Persichetti, Peter Ramsey, and Rodney Rothman. #5's Spidey senses are tingling waiting for the movie to start! 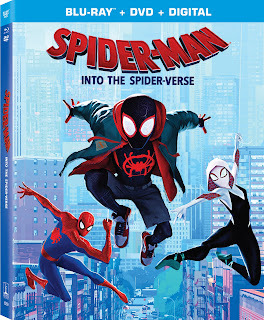 SPIDER-MAN: INTO THE SPIDER-VERSE arrives filled with engaging bonus materials that are fun for the whole family and give fans even more of the unique comic book style action that they loved in theaters with over 90 minutes of bonus content. In his very own original short, Spider-Ham: Caught In a Ham, fan favorite Spider-Ham defeats his greatest foe, delivers sidesplitting puns, and get sucked into another dimension! It actually can get weirder! Don’t miss the thrilling Alternate Universe Mode where fans can view the film in an entirely new way to discover alternate scenes, plotlines, characters, and more with the filmmakers as their guide. 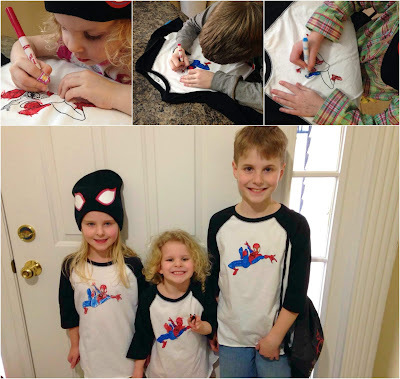 The kids LOVED decorating their own Miles Morales T-shirts! Also included is The Spider-Verse Super-Fan Easter Egg Challenge, where fans are challenged to find every single Easter Egg hidden within the Spider-Verse (and there are a lot of them!). Explore the character design in the visually stunning film including specific looks at the now-iconic Spider-Ham character as well as the classic villains who inhabit the Spider-Verse. Additional special features include a celebration of the diversity in the film and the idea that anyone can wear the mask in a feature called We Are Spider-Man, a featurette called Spider-Verse: A New Dimension, where fans can hear from the artists and filmmakers who pushed the boundaries of the comic book artform to create a visual experience unlike anything done in animation before, a showcase of all the amazing fan favorite characters featured in the Spider-Verse and the actors who bring them to life, and a touching tribute to comic legends Stan Lee and Steve Ditko, who originally created the Spider-Man character. Other bonus materials include two lyric videos featuring “Sunflower” by Post Malone and Swae Lee and “Familia” by Nicki Minaj and Anuel AA (feat. Bantu). 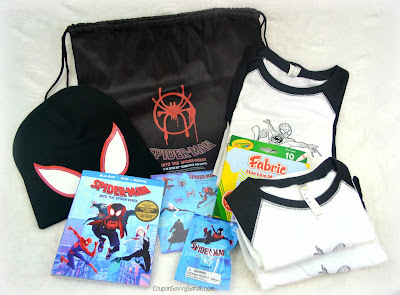 Enter to Win a Spider-Man: Into the Spider-Verse Blu-ray Prize Pack (includes the items shown above) - Giveaway Ends 3/30/19! Just Enter on the Rafflecopter form below! I don't have a child but my favorite kids movie is Coco. My son's favorite animated movies are anything Thomas the Train or Paw Patrol. He loves both series very much. Right now B loves Spiderman. Annabelle loves everything. My son loves this movie so much! We went to seen it on a mother/son date day. He even had to have a Miles Morales costume! My girls love Lion King! My 3 year old daughter loves all the Toy Story movies. My 6 year old daughter loves The Incredibles. My kids love all animated movies. I would say that my son really likes Toy Story and Ratatouille and my daughter is a big fan of Lego Movies. Up is the family favorite because the kids want to see it with us. They have been really love Frozen and Despicable Me recently. Our son Grady loved Spiderman, but our girls love Beauty and the Beauty and Frozen. My daughter's favorite animated movie is Lion King. My son's favorite animated movie is Wreck It Ralph. He loves puppy pals and paw patrol and all super heros! One of our favorite movies is How To Train A Dragon. My little girl loves Finding Dory. It is her all-time favorite. It's gotta be the Lion King! My son's favorite animated movie is Cars! Right now my kids love Miraculous Ladybug and Super Monsters. I'm a huge Marvel fan and we've been wanting to get this DVD! My daughter (a teen) loves Frozen! And my son (also a teen) loved The Incredibles! They love Spirited Away best. My son loves Disney Cars. My son loves Wreck it Ralph and anything Lego! The Lego movies are definitely some of his favorites!! Currently my daughter is claiming Reck it Ralph as her favorite movie. My five daughters love Zootopia, Frozen, Tinkerbell just to name a few; my sons love Spider-man, Thomas, Paw Patrol! Thank you!